The Fastest Way to Make Money in Forex! – You don’t need all those expensive training courses and over-priced software. – You don’t need the months it takes to learn all the ins and outs of the Forex market… Months you could be making money instead! – You don’t need to spend hours upon hours a day watching a computer screen just so you can jump in on any little movement in the market. Glorified gambling at its best. Plain Forex Signals are made for people like you who actually have a life. It’s easy to learn – easy to use – easy to trade. At the end of the day, we’ll send you an email with charts and detailed explanations of all trades made during that day. Get your trades sent to you this morning – make your profits tonight. There’s no easier way to make money in the Forex Markets! Why should you choose Plain Forex Signals? • No need to constantly watch the markets – Set your trades and Go! • Ask Questions – Get Answers – Fast! • Access Anywhere – Home, Car, Office or Beach. Good things really do come from Canada! The trades today were impressive, and I loved how you handled them step-by-step – very professional and methodical, I love it! The copier is so sweet and sophisticated, just awesome! All my trades were closed correctly (at least I think so, I will compare against your emails), and I made almost 80 pips in one day. Nice, nice, nice. I am so glad I decided to take part in this and found you when I did. As you know, 99% of signal providers are PURE MARKETERS and stink at trading, they’re just in it to collect fees…with you I feel I may have something genuine! Bless you and your Canadian self, Dave, thank you for making your expertise and knowledge and skills available to other people, that is so very kind! really like this service. explanations are clear and appreciated. hope you and your service stay around a good long while. great trading yesterday……helps keep my optimism up to leave my company for full time trading next year.Hi Dave, Good call today! Thanks very much for your detailed answer Dave. A lot of Pips! Dave, Good call. Hope the mojo be with you. Well done. A nice profitable week! Hey Dave…made some nice pips today! Subscribe to Plain Forex Signals and reach Financial Independence Faster. You can cancel any time. No Contract – No Obligations! 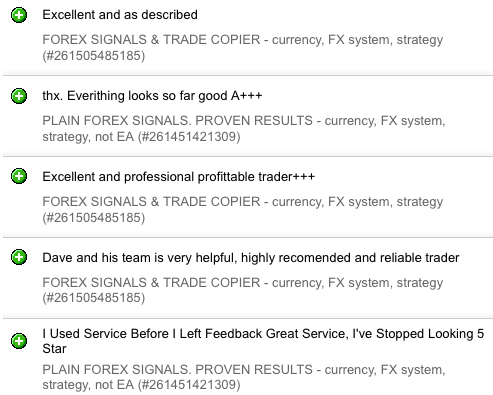 Plain Forex Trade Copier automatically copies all trades we’re making – directly to your Meta Trader 4 account. You can use it from your home computer or you can use a Virtual Private Server. • No need to constantly watch the markets – Everything is done automatically! Subscribe to Plain Forex Trade Copier and reach Financial Independence Faster. What are you waiting for? Join Us Today and Make Money Tonight!